New decade! New guitar player! New album! The 1980s were over, and Iron Maiden faced many challenges in maintaining their status at the dawn of the 1990s. Iron Maiden had conquered the world. The 1980s were their decade, like the 1970s had been Led Zeppelin’s decade. From 1984 through 1988 Maiden were the biggest metal band on the planet in terms of popularity, and could hardly be faulted for their innovation either. Following a year off in 1989, at the end of which the Maiden England concert video was released, Iron Maiden reconvened at the dawn of a new decade. The 1990s would bring multiple changes and struggles to the band, and their claim to the metal throne would be challenged. The first change occurred when guitarist Adrian Smith, who had recently released his first solo album with the band ASAP, became disillusioned and was pushed to leave Maiden. The source of Smith’s frustration was partially the musical direction that Steve Harris and Bruce Dickinson championed for the new project: A stripped-down, back-to-basics approach, reminiscent of the Killers (1981) album. Click here for a review of ASAP’s Silver And Gold (1989)! The first line-up change in seven years occured as Iron Maiden entered the 1990s. Adrian Smith left and the new-look Maiden was, left to right: Nicko McBrain, Steve Harris, Bruce Dickinson, new guitarist Janick Gers and Dave Murray. The resulting album, No Prayer For The Dying, is a radical stylistic departure from the previous couple of studio albums, with hissing guitars and a snarling Dickinson up front, and a very direct «garage» kind of production by Martin Birch. Truth be told, the producer was against doing the album on an ancient mobile unit in Harris’ rehearsal barn instead of a real studio. He probably did the best he could, but the well-produced late 80s Maiden sound was now a thing of the past. Tracks like opener Tailgunner and the rousing Fates Warning actually benefit from the shift in production values, the latter being one of those rare Dave Murray compositions. But there is no disguising the fact that the band also deliver material here which is well below the high-water mark of the previous record. First single Holy Smoke and the compulsory album epic Mother Russia are among the weakest tracks that Maiden had ever committed to tape at that point, and Hooks In You (co-written by Smith and Dickinson) isn’t much better. The return of Iron Maiden in 1990 also saw Eddie return to his original hobby of stalking city streets and infernal landscapes. Here he’s trashing TVs in Derek Riggs’ artwork for the Holy Smoke single. 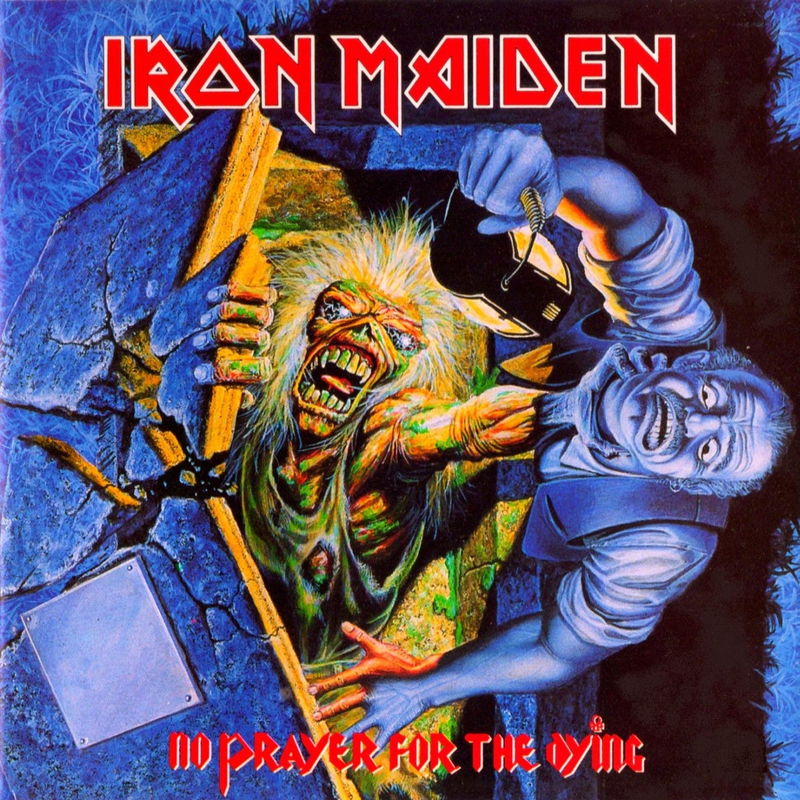 No Prayer For The Dying also features the weakest title track since the dawn of Maiden’s classic era. Which doesn’t mean it’s a bad song, just average. Actually, Dickinson went on record upon the album’s release in 1990 to claim that it was one of the best “quiet-beginning” type of songs he had done with the band. Take that, Hallowed Be Thy Name, Children Of The Damned, Revelations, and Infinite Dreams! This kind of statement certainly highlights the dedication to the project that drove the band at the time, but in retrospect it seems overstated. Maiden took their back-to-basics music on the road with a back-to-basics show. Which meant no pyro, no conceptual production, and the introduction of the Eddie backdrops that would forever be a staple. On the plus side, Smith’s replacement is one Janick Gers, and the injection of energy is palpable throughout the record, as it would be on stage. Not as sophisticated as a player, Gers is a much more free-form kind of guitarist, but the collective energy level of the band has rarely been as high, and this helps them partially counter the weakness of the production. Much of that is thanks to Gers. Click here for the full tale of Adrian Smith leaving Maiden, Janick Gers joining, and the making of No Prayer For The Dying! Janick Gers would bring a fresh spark of enthusiasm to Maiden’s live shows, matching both Steve Harris and Eddie. It’s just not enough to salvage an album that fails to live up to expectations that are perhaps unfairly high in the wake of the band’s unreal 1980s period. But what else should we demand from Maiden than excellence? Given my previous criticism of the songwriting on Somewhere In Time (1986) – which is a really good album – it’s clear that I hold Maiden to a very high standard, and No Prayer For The Dying is a frustrating step down from the output of the classic 1982-88 period. Visually, the album also marked the end of the days when fans could look forward to intricate concepts and feasts of design and packaging, with artist Derek Riggs turning in an uninspired work that seems so painfully one-dimensional in light of the previous four or five record sleeves. In truth, it is nothing more than a cheap rip-off of Riggs’ own Live After Death (1985) masterpiece. After giving Eddie a surreal narrative in his journey through cover concepts from 1981 to 1988, it is now back to basics like none of that ever happened. Artist Derek Riggs has admitted that he felt disillusioned with Maiden after 1988, claiming that he didn’t have ideas about what to do with Eddie after dissolving him into the frozen river of souls on the cover of Seventh Son Of A Seventh Son. The No Prayer era Eddies would revert to less sophisticated concepts, along with the band’s music. Tailgunner, Fates Warning and the deliciously melodic Run Silent, Run Deep get top marks, and Dickinson’s solo album leftover Bring Your Daughter…To The Slaughter did become the band’s biggest hit in the UK despite being far from the strongest Maiden single ever released. The title track is all right in its quiet half, The Assassin is okay minus, and Public Enema Number One is energetic enough to entertain, if you just forget about the title. Click here for a review of Dickinson’s Tattooed Millionaire (1990)! Maiden had an unexpected hit single in the UK with Bring Your Daughter…To The Slaughter, which was partially contrived by releasing a multitude of formats for fans to buy. No Prayer For The Dying is a better album than the one that would follow it just 18 months later. There is still enough of the 1980s Maiden spark to just about carry them through, and with later 1990s Maiden releases in mind it is probably safe to assume that Martin Birch saved the production from being a train wreck. But when only about half the tracks get near the expected levels that were defined by the band’s first decade of recording, Iron Maiden greet the new decade with their poorest LP offering to that point. This is a far cry from Piece Of Mind (1983), Powerslave (1984), or indeed the previous record, Seventh Son Of A Seventh Son. The 180g black vinyl reissue is also of little interest, except for the monumental errors in renaming Tailgunner “Tail Gunner” and messing up the lyrics to Holy Smoke. And for Maiden the troubles were just beginning. Their subsequent album would be the last of the original Dickinson era and lead into a period of commercial darkness that they would only shake off upon his return in 1999. Click here for our retro review of Fear Of The Dark (1992)! No Prayer is alright as a bit of fun for the fans, a record that sounds unlike any other Maiden album whether you see that as a good or a bad thing. But it’s just a diversion, accepted mostly because of the greatness that preceded it. After SSOASS came this album … At first very disappointing for me, and certainly an album that does not reach the level of what is Iron Maiden. However, over time will I have a special affection, and songs like ” Tailgunner “, “Holy smoke” , “Public Enema Number One” or ” Fates warning” make me feel things. Perhaps a more careful production would have given another dimension to album; lack of Adrian is much appreciated… no arrangements, the songs do not sound sometimes flexible… Anyway, I like more than ” Fear of the Dark”, though many think otherwise. This was the first Iron Maiden album I bought (in red vinyl), so I have fond memories associated to it. However, the albums that made me a fan were “The number of the beast” and “Live after death”, which I got recorded in cassette tapes by a classmate shortly afterwards. That being said, I still think “No prayer for the dying” is a really average album (I think the only Maiden album that I find worse is that turd called “Virtual XI”), showing the problems that were to plague the band in that decade. “Fear of the dark” has some really weak material, but the strong songs are, IMHO, much stronger than the best stuff off “No prayer for the dying”. I agree with you… The fact that Fear Of The Dark had more material doesn’t justify it to be worse than NPFTD, cause as you said the strong moments on fotd are way stronger than NPFTD’s. I’ll get to Fear Of The Dark later, but I’ve already implied that I think No Prayer is a stronger album. Like Ghost says, FOTD has some really weak material, I’d say it’s got the weakest material of any record in Maiden history bar Virtual XI… But yeah, a few of the songs are strong. No Prayer was the first Maiden album I was waiting for upon release. The first I bought was Seventh Son in 88 or 89, but prior to that I became a fan when a friend let me borrow the Live After Death cassettes. LAD + SSOASS meant I was deeply into the more mystical aspects of Maiden, so even though I was just 12 at the time of No Prayer I remember being disappointed with that album… I couldn’t articulate it at the time, but I was all geared up by Maiden’s 82-88 albums and felt underwhelmed by No Prayer. 1 Vocals – Bruce’s new growly, snarly vocal style really grated on me, it was like he was trying to be Brian Johnson or Axel Rose. It was probably easier for him to sing, so maybe it was related to this, as his live performances weren’t great on SSOASS tour. 2 Guitars – With the departure of Adrian Smith, the guitar solos seemed to lose all structure and cohesion. I think Smith’s more structured solos kept the more free-flowing Murray in check, but when Gers arrived it was actually Murray who was the more disciplined player, meaning everything just got very widdly widdly! 3 Song writing – Obviously not as good as (any) previous albums, but not a total disaster in my opinion. Better production, guitars and singing would have made a huge difference. 4 Artwork – Very poor! I think this was the first Maiden album where I bought the cassette rather than the LP, mainly because the artwork wasn’t worth the detail. I actually bought a second hand LP last month as a collection filler, and the artwork is still rubbish in my opinion. All four of these complaints are about to get louder with the next release though!! 1 – It’s an interesting thing how Bruce changed his style. But to be fair, the more aggressive style was exactly what Maiden (Steve) wanted at the time. Bruce was also back to hitting high notes he hadn’t been near for five years. 2 – Very good point, in my opinion. 3 – Also a good point. There is stuff here that could possibly have been developed into another classic Maiden album, with the aid of Smith and more time to write. It’s a shame that Bruce and Steve got into the whole “let’s do it quickly with a mobile studio” spiel, because there could have been something better coming out of this. 4 – Good point again. Many people criticized the singing of Bruce in several of the songs of NPFTD … but the truth is it was not a new style … Just listen “Powerslave” or “2 minutes to midnight ” to realize it. It’s like people who criticized singing the verse of “El Dorado” … is it not the same singing the verse of ” The Evil That Men Do”? Too true. One of the weirdest things I’ve ever witnessed from Maiden fans was the thing about El Dorado having “spoken words” and not singing in the verses. That’s just a patently absurd statement. Musically, this album is, in my opinion, a step back for Maiden, considering what they accomplished with Seventh Son. The idea of “getting back to their roots” seems to have been successfully realized, but I question if that was necessary. That was certainly Adrian’s mindset, it seems, and that had to be a big reason why he left. Still, this isn’t a bad album by any stretch of the imagination. The overall tone on a lot of the songs could be considered….shall I use the word “playful”? Even some of the more politically-minded songs like Holy Smoke have a not-so-serious sound to them. Like, it seems the boys had a lot of fun making this album. Maybe too much fun, however, as, while not bad, for Maiden standards, it falls woefully short, especially considering the masterpiece they had just made. What separates it from Fear of the Dark, in my opinion, is that it doesn’t overstay it’s welcome and gets over with quickly.